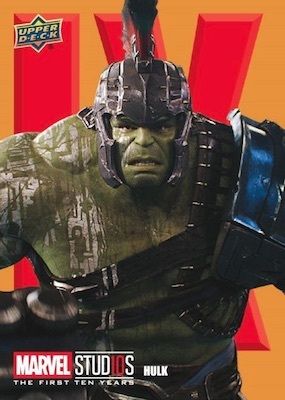 2019 Upper Deck Marvel Studios First Ten Years celebrates a decade of the Marvel Cinematic Universe (a.k.a. 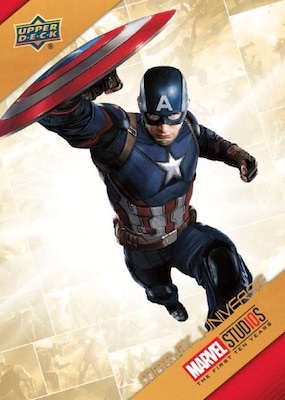 MCU) in trading card form. 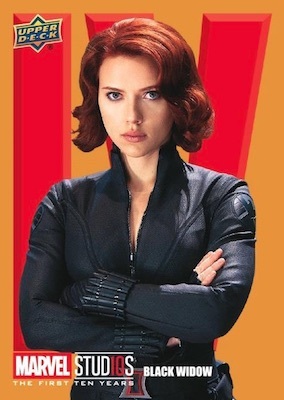 Although Marvel Comics is a long-running heavyweight, MCU is still fairly new to the collecting scene having only started with 2008's Iron Man. 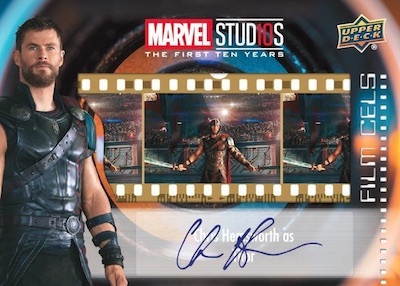 Featuring representation from various Marvel movie sets in Upper Deck's entertainment portfolio, each Hobby box averages one autograph, relic or sketch card. 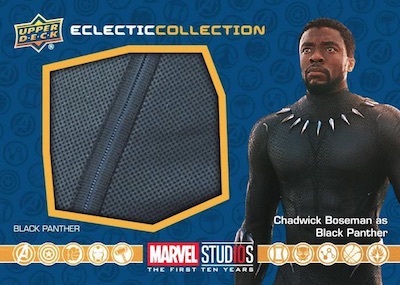 With one base SP card or insert per pack, the Upper Deck Marvel Studios First Ten Years checklist highlights MCU favorites. 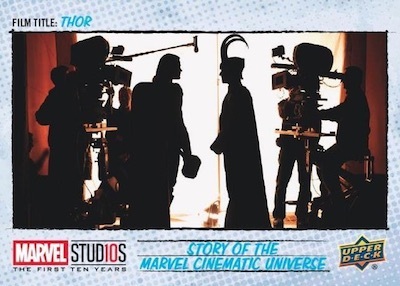 The main Marvel Universe cards showcase images from past films. In addition to 100 cards in the base set, there are 50 short prints, giving set builders more of a challenge. The SP cards average around six per box. Filling out the insert lineup are several choices, including the Roman Numeral set that looks back over the 10-year period. These number-based cards average approximately four per box. Another option is the manufactured Film Cels set that displays 35-mm images. These come one per box. Rare versions include Film Cels SP, Film Cels SSP, and Film Cels Auto Combo cards, which act as a box hit. 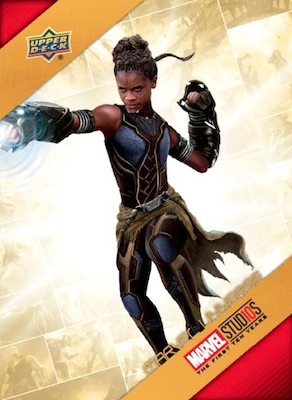 Every Hobby box of 2019 Upper Deck Marvel Studios First Ten Years should also contain a premium hit card. 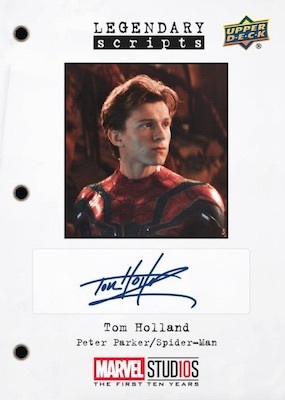 Possible pulls include Scripted Scripts autograph cards from the cast and crew, Film Cels Auto Combo cards, Eclectic Collection / Eclectic Collection SP wardrobe cards with screen-worn and/or production-used relics, or hand-drawn Sketch cards. 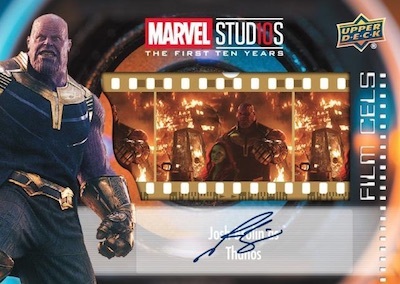 UPPER DECK AVENGERS INFINITY WAR AUTOGRAPH AUTO #II-MG POM KLEMENTIEFF "MANTIS"
150 cards, including 50 SP (1:2.5 packs). Overall odds - 1:432 packs. Specific group odds noted below. Overall odds - 1:90 packs. Specific group odds noted below. 45 card, including 10 SP. 33 cards, including 8 SP and 5 SSP.